Made by John Sands Pty Ltd in Australia, Oceania, 1955. While test matches between Australia and England have drawn large crowds of spectators since the 1920s, and backyard cricket has been a favourite game amongst children, it was only after the Second World War that manufacturers of games turned seriously to a game involving cricket. This game was one of the most popular in the pre-television era. 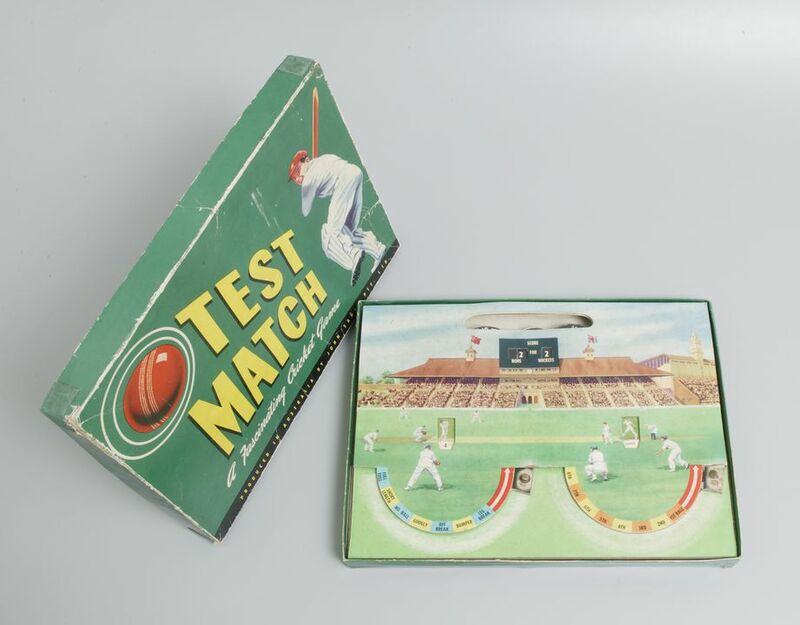 Board game with packaging, cricket, "Test Match", cardboard / metal, John Sands Pty Ltd, Australia, . Board game: game consisting of a rectangular cardboard piece illustrated with a cricket ground, players and a scoreboard. Two semi-circles have been cut away from the background and are used to control the progress of the game. The right hand game control is moved to 'ball' position (1-8) and back to start which indicates the type of delivery shown in the window. The left hand control is moved to 'type of delivery bowled' and back to the start which reveals the number of runs scored or method of dismissal which is shown in the window. The scoreboard is operated by three circular wheels that show the result of runs and wickets. An oval handle is at the upper centre. Packaging: green cardboard box with lid, lid has an image of a batsman and a red cricket ball, containing 'a fascinating cricket game' called 'Test Match'. Packaging: handwritten numbers on interior of lid '141/I/132/67/119'. Handwritten doodle on interior, in red ink. Made in Australia by John Sands Pty. Ltd.